EPIX's Pennyworth series is set to show a new side of the DC Comics universe, and it just enlisted a familiar face to do it. 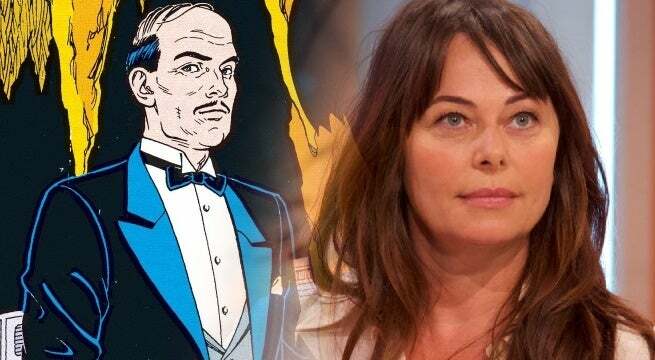 According to a new press release from the network (via Broadway World), Polly Walker has been cast in Pennyworth in a recurring role. Walker will be playing Peggy Skyes, one of Lancashire's busiest and most successful dominatrixes. Described as the sensible matriarch in a family of maniacs, Peggy is fiercely loyal, endlessly resourceful, and lives by her own strange but rigorous moral code. She also is the syster of Bet Sykes, who will be played by musician Paloma Faith. Walker's filmography includes Warehouse 13, Rome, and Caprica. The series will star Jack Bannon as a young version of Alfred Pennyworth, with Ben Aldridge co-starring as Thomas Wayne. The cast will also include Ryan Fletcher, Hainsley Lloyd Bennett, and Jason Flemyng. Pennyworth has been in various stages of development since 2016, but was given a 10-episode straight-to-series order in May of this year. The series is produced by Gotham boss Bruno Heller, along with co-executive producer Danny Cannon. "As genuine fans of these classic DC characters, as well as the incredibly talented Bruno Heller and Danny Cannon, we couldn’t be more excited to make Epix the home of this series," Epix president Michael Wright said when the series was first announced. "We can’t wait to work with Bruno and Danny — along with Peter Roth, Susan Rovner, Brett Paul and the team at Warner Horizon — on this fantastic origin story. "I'm very excited, you know, I'm honored that the fact that I've, I can say this narcissistically that I've piqued people's interest enough to prove to them to be worthy of having his own spinoff show," Gotham's Alfred, Sean Pertwee, told reporters during a recent set visit. "It's ironic that I'm a sort of younger version of The Dark Knight's [Alfred], of Michael Cain, and they're going younger still. I want to be in it in some capacity, but we'll wait and see. So, if you see Daniel [Cannon] or Bruno [Heller] have a word." Are you excited to see Walker join Pennyworth? Let us know what you think in the comments below.